This Easter we are in South West Turkey for a relaxing holiday after a busy term – a holiday that may include some of the regions wonderful orchid species. I will keep you posted on what we find. Today has been a relaxing day around Dalyan which included a walk to the site of the ancient city of Caunos. Along the way we found Ophrys lyciensis (above) an orchid endemic to this area (which was ancient Lycia, so it is a great name). 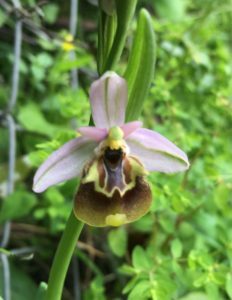 This is similar to our British Bee Orchid (Ophrys apifera) but is a different shape and has different patterning. 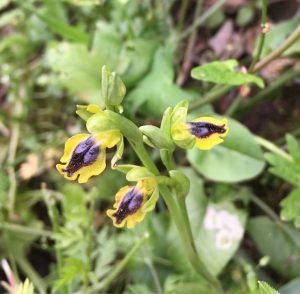 We also found Ophrys lutea, a widespread species we have seen in Crete. 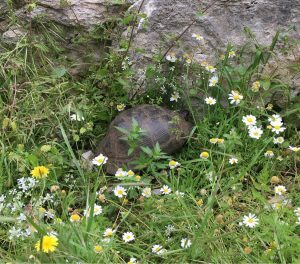 Another spectacular find was this tortoise amongst the spring flowers.